We are God's mouth and hands in this world, and how we pray is important to our life together in Christ's Body, the Church. C. F. W. Walther’s For the Life of the Church reunites today’s Christians with a treasure-trove of prayers that relate to all facets of public Christian life. These prayers reinforce basic Christian principles even as they bring the sweet message of the Gospel to those who need to hear God’s Word for their lives. Additionally, a series of addresses explains both the cost of discipleship and the rewards of church membership. The following is a prayer for the New Year and an address entitled “The Joy of Discipleship” from For the Life of the Church. Lord, our God, all-knowing and all-wise, whatever in time You bring to pass You have already resolved in eternity. Throughout our lives You have been very merciful to us. You have let us hear and learn Your Word, and by means of it You have brought us to the knowledge of our sins and of Your grace. Through Your Holy Spirit You have kindled and preserved within us faith in Jesus Christ, Your only Son, our Savior. It is certain therefore that already from eternity You have bestowed Your grace upon us and resolved to make us Your children. Thanks be to You in time and eternity! But, O Lord, from Your holy Word we learn that, while we ourselves can contribute nothing toward our salvation—all glory belongs to You alone—we can indeed do much to lose it. Therefore we pray You, take us altogether into Your gracious care; let us be to You as clay in the potter’s hands; guard us against the desires of our wicked flesh and blood, against the enticements of the blind world, and against the treacherous assaults of the devil. Help us to pass safely through all the dangers threatening our souls and grant that during this new year we may either depart this life in peace, or, if we live through it, grant that the end of the year may find us still enjoying Your grace. Pour out Your blessings upon this first meeting of the new year for the sake of Jesus Christ, our precious Redeemer and Savior. Amen. To unite with a Christian congregation appears to many as something unimportant as well as unpleasant. 2. Because of those within the Christian congregation who have given great offense; for the world is constantly watching the Christians with eagle eyes. That such is the case cannot be denied. But also this is sure, that, when a baptized Christian unites with a Christian congregation, that person is taking an important step as well as one that brings with it much joy. Recall the words of Jesus concerning the Jews: “I have other sheep that are not of this fold. I must bring them also, and they will listen to My voice. So there will be one flock, one Shepherd” [John 10:16]. Christ wants to gather all of His believers into one great flock. Recall furthermore what Christ says to His believers, whom the world despises and persecutes: “Fear not, little flock; for it is your Father’s good pleasure to give you the kingdom” [Luke 12:32]. 2. It is the Father’s good pleasure, not the reward of your own efforts. Nor is it uncertain, for what God has decreed according to His good pleasure cannot be overthrown. Therefore enter our congregation with joy. Although we are despised by the world, God has honored us with a glorious promise, which you, too, are now to share. 1. We must receive them as brothers and sisters, show them that we love them, never desert them when they are in need of any kind, and make them feel at home among us. 2. We ought very diligently and zealously to guard our conduct so that we do not cause either them or the world to be offended. We must also see to it that we are not to blame when the world despises us. 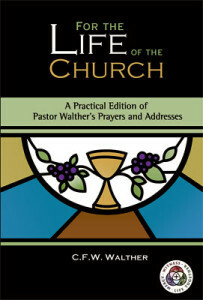 From For the Life of the Church: A Practical Edition of Pastor Walther’s Prayers and Addresses, pages 109–10, 181–82 © 2011 Concordia Publishing House. All rights reserved. To order For the Life of the Church, please contact CPH at 800-325-3040 or visit www.cph.org.